One of the most popular Ayurvedic tonics. Contains more than 80 minerals in their natural, organic and ionic forms. « Primavie® », a purified shilajit extract standardised in bioactives, particularly fulvic acid, is the result of many years’ work aimed at ensuring the highest bioavailability for its ingredients. ¤ In its natural form, shilajit is a bituminous substance which, during the hot season, oozes from craggy rocks in the foothills of the Himalayas and which is also found in Kashmir, Pakistan and Tibet. A compact mass of vegetable matter, Shilajit contains 84 different minerals in their natural organic and ionized forms, benzopyrones, triterpenes, phenolic lipids, humic acid and fulvic acid. The latter is particularly effective at transporting molecules and has multiple beneficial properties. ¤ Shilajit is one of oriental medicine’s most highly-regarded tonics. It features in ancient ayurvedic texts dating back more than 3000 years. Traditionally, it has been used more for its tonic and adaptogen properties. 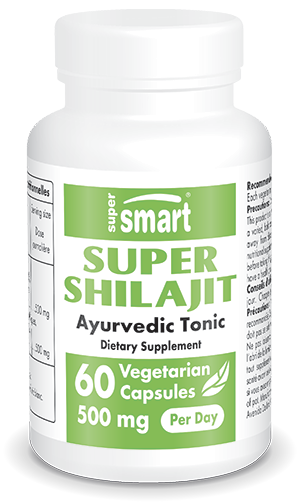 Ayurvedic practitioners have long claimed there are few treatable diseases which cannot be managed or cured by shilajit. For over 25 years, modern medicine has been engaged in research to confirm the basis of these claims and scientists are working to evaluate its mechanism of action and to identify its effects. • Fulvic acid in shilajit helps increase energy and endurance, by maintaining and regenerating the body’s natural biological and catalytic functions. It has been shown that when shilajit is combined with coenzyme Q10, energy production increases by 56% in the brain and 144% in muscles. • Shilajit enhances CoQ10’s beneficial effects by stabilising it in its superior form, ubiquinol, which prolongs its effects at a cellular level, particularly in mitochondria, where it aids the conversion of fats and sugars into ATP (adenosie triphosphate), resulting in increased cellular energy. • Therefore, taking Shilajit and CoQ10 together is of particular benefit in terms of anti-ageing since it increases the cell-energising effect of coenzyme Q10 which tends to decline with age. Shilajit thus helps restore normal mitochondrial energy function. • Fulvic acid improves absorption of other plants and nutrients; as a transporter, it optimises absorption and delivery of the majority of nutrients to target-cells within the body. • It boosts respiratory function and is particularly beneficial for allergies, decreasing mast cell degranulation and thus release of histamine. • It reduces inflammation and also increases gastric-protective secretions, thus inhibiting ulcers. ¤ Studies also suggest that this adaptogen may promote emotional equilibrium and have a positive effect on stress management and libido. ¤ More recently, scientific attention has turned to its anti-diabetic effects; several studies show that fulvic acid is beneficial for controlling blood glucose and reducing oxidation. ¤ Last but not least, studies have specified its antioxidant action and ability to neutralise certain free radicals - sulphite anions (SO) and hydroxyls (HO). Other research has demonstrated the ability of concentrated shilajit extract to regenerate L-ascorbic acid (vitamin C) following its neutralisation of free radicals. « Primavie® » shilajit, a new, scientifically-supported form of an ancient and renowned ayurvedic tonic, is a natural, effective, safe and polyvalent product which can be taken either long-term or as and when required. Adults. Take 2 capsules a day. Each capsule contains 250mg of PrimaVie™. Contra-indicated in cases of kidney stones.